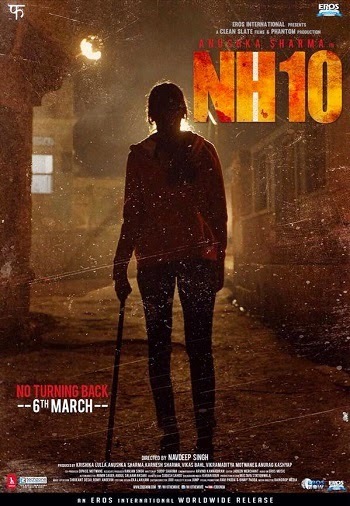 NH10 is an upcoming Bollywood Indian Hindi thriller film which is going to be releasing on 13th March 2015.NH10 is directed by Navdeep Singh. This film is Produced by Anushka Sharma . Anushka Sharma is entering in the filed of the Production by this film. This movie is co-produced by Phantom Films. 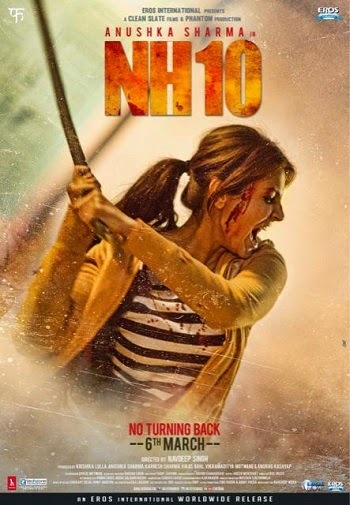 Anushka Sharma and Neil Bhoopalam is in lead roles in the NH10 Film. The film's title refers to the 403 km long National Highway 10 that starts from Delhi, passes through Haryana via Bahadurgarh, Rohtak, Hisar, Fatehabad, Sirsa and ends at the Pakistan border in Punjab. Formerly , The film was scheduled for release on 6 March, 2015 but due to some censoring issues with the Censor Board of India the Movie is now releasing on 13th March 2015. The story of the film is revolving around Meera (Anushka Sharma) and Arjun (Neil Bhoopalam) they are professionals living in Gurgaon(NCR). One Night when Meera is coming back from a Party a group of some violent men attacked on her. But She save herself from the attackers. Arjun blaming himself for not being with Meera that night so he make a Holiday Plan so Meera can feel Happy and Fresh. As they Stop on a Highway Dhaba for Dinner ,they witness a young girl being picked up by a bunch of hoodlums. Arjun chooses to step in, unmindful of the danger ahead. The official trailer of the movie is out and it captures your imagination since the very start. Anushka Sharma, as usual, is full of energy and subtlety. This Movie will be Released on 13rd March 2015. For More Movies Stay Updated with Us.